​We have bicycles to suit all ages, as well as kiddies' trailers, tag-alongs, child seats and everything you need to make your Achill cycling experience perfect. New are the Kalkhoff Electric Bicycles that are flattening Achill's hills! Every bike hire includes a helmet and high visibility vest. Baskets and panniers are also available. Try one of the three looped cycle routes along Achill Island's Wild Atlantic Way. Keem Bay is only 5km from our HQ, and the old Slievemore Road beside us provides an off-road route to the famous Deserted Village, also only 5km away. Picnic lunches can be provided on request, and group rates are available. Achill Island, County Mayo, is an ideal place for a cycling holiday. Achill is the hub of the West Mayo Cycle Network that includes the Great Western Greenway and numerous alternative routes throughout the island. Picnic stops, local pubs and restaurants are dotted along the Achill Cycle Network, which offers breathtaking views of the wild Mayo coastline. Achill has a wealth of historic sites and excellent facilities and activities. The island has a long history of human settlement with megalithic tombs and promontory forts dating back more than 5,000 years. 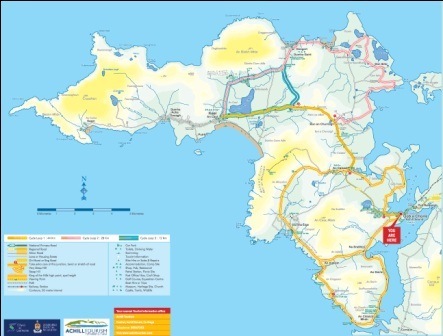 The Great Western Greenway is a 42km traffic-free cycling and walking facility that primarily follows the line of the famous Westport to Achill Sound Great Western Midlands Railway. The route offers gentle gradients and some of the most idyllic scenery in the west of Ireland. ​We are still waiting patiently for Mayo County Council to extend the Greenway onto Achill Island, and we live in hope that future development will bring it all the way to Dooagh. Hopefully before we die... :).